Speak to Chuck the polar bear in Ardougne Zoo. 1. Start off the quest by speaking to Chuck in Ardougne Zoo. It turns out that Chuck has received a ransom letter from the Walrus, who’s taken his agent, Teddy, as prisoner. You'll be assigned the task of retrieving Teddy from the POW (Prisoner of Walrus) camp. Chuck lets you know that the best place to start would be the seals near Rellekka, where Larry’s boat is docked. Speak to Chuck to teleport straight over to the boat. 2. Run south-west to the seals and wake up the black seal in the middle of the group. He will refuse to talk to you until he’s entertained, so try using the dance emote (other emotes similar to dancing will also work). Talk to the seal again and he will be uninterested in your dancing and reveals that his favourite band is in fact Ping and Pong, everybody's favourite rock and roll penguins from the earlier in the series. Time to go and enlist their help once more! Take Larry’s boat over to the penguin island. 3. Speak to Ping and Pong who are standing right by the landing area. Eventually they ask you to make their costumes for the upcoming gig for the seals and will give you the required materials. If you lose any of these materials you’ll have to get new ones yourself! To make the costumes you can either use a crafting table in your house (or a friends! ), alternatively you can use the workbench found inside the KGP base. If you choose to use the KGP base, head northeast and speak to Jim to get into your penguin suit. Once in your suit, head west and investigate the avalanche to enter the base. 4. The workbench is located in the War Room, so head all the way north until you reach the large metal doors and speak to the KGP agent. He’ll tell you he's given up on trying to stop you and will let you through. The workbench is located in the room to the north-east. Once you’ve crafted the Rock and Pop costumes, return to Ping and Pong. To get back through the metal doors, push the big button to the west of the doors. Be sure to get out of your penguin suit by talking to Jim once more once you get out. 5. Once they’ve gotten their costumes, take the boat back to Rellekka and speak to them again to start the gig. The seals are so impressed that they want the band to perform at the POW camp. They agree to let you come along under the condition that you don’t bring any items with you. If you are holding any items, the seal will offer to bank them for you. Simply speak to the seal again to be taken to their camp. 6. Speak to Teddy in the clown costume in the middle of the camp. He tells you that he’s found Larry but Larry refuses to leave the camp. Speak to Larry who’s been brainwashed into thinking he’s a penguin and is convinced he needs to get an egg. Head back to Teddy and you’ll come to the conclusion that the first step is to find an egg for Larry. Speak to Teddy again about how to find an egg and he’ll mention rumours of a black market. 7. Head over to the house in the south-west corner, and speak to Noodle. He’ll reveal that the Walrus eats eggs for lunch. Try to enter the Walrus’ house in the south-east corner to confirm he has an egg in it. Take the bat-in-a-box from outside the house and try to create as much noise outside as possible. Speak to Bouncer, Ping and Pong and Teddy to make the noise. The simplest way to maintain a high enough noise level is to run in a circle between them and encourage them (Ping and Pong are both encouraged by just clicking one of them). Keep doing this until a cutscene begins, where the Walrus begins to lecture the seals. While the Walrus is busy, enter his house and steal the egg from the table. Return with the egg to Larry. Egg-sellent! 8. Now that Larry is finally willing to cooperate, it’s time to form an escape plan. Speak to Teddy and then speak to the six penguins wandering around the camp to see if they have any plans prepared. There are two penguins slightly north of the open area in the middle of the camp. After speaking to all six, return to Teddy. While speaking to him, Ping and Pong will interrupt and help you come up with the idea to use the rock show as a front to repair the submarine, however Teddy needs the blueprints to the submarine to repair it. Speak to Plaza, the nearby old penguin, who will give you a list of Battlefish supplies that you need to obtain before he’ll give you the Blueprints. Olive oil, sugar cube, popsicle tray and rock carving hammer from the shelves inside the house next to Plaza. Board from the wood scrap pile just north of the house Plaza is playing by. Ripped fabric after asking Teddy about his chequered outfit. Shark tooth and Squid from fishing from the fishing hole in the northeast corner of the camp. Corkscrew and a bottle of lye from the south-western house. 9. Use the olive oil with the lye to make unmoulded soap, next add the soap to the popsicle tray and then use the squid to colour parts of the soap. Finally use the rock carving hammer to finish the Battlefish pieces. The board is made by using the ripped fabric with the board. Return to Plaza to receive the blueprints and then bring the blueprints back to Teddy. *Note that G6 overlaps and only has to be clicked once. Once you’ve beaten her she’ll unlock the door to the storage room just south of her. Search the circus props to pick up the required items and return to Teddy to fix the engine. Use the plain wire with the balloon and use it with the wirebox. Use the bowling pin to repair the lever. Use the coloured disc on the pressure gauge and then use the finger on it. Use the purple cloth to repair the pipe. 11. It’s finally time to escape from the POW camp. Speak to Teddy and a cutscene ensues in which you board the submarine. Once on the submarine, speak to Teddy again to find out that the seals are pursuing you. You now have to engage them in another round of Battlefish, with the additional job of maintaining the different stations on the submarine. The additional passengers on the submarine can be assigned to the different stations but they’ll only stay there for a short period of time before returning. The bar over their heads will slowly fill from orange to blue, showing their ability to work again. As the chase goes on, the submarines stations will slowly degrade and you’ll have to reassign the penguins to keep all the stations in shipshape. In between assigning the passengers, you can click the periscope in the left room to resume the game of Battlefish. Sinking the enemy’s ships will replenish your submarines health. 12. The quickest way to do this is assigning the passengers to stations as soon as their bars turn blue, and when you miss in the Battlefish game, simply click the message to make it disappear and thereby speed up the game. If you fail you’ll appear in front of the Grim Reaper along with Ping and Pong. Exit the portal and speak to the seal to try again. Note: If you log out during the escape, you’ll have to start over by speaking to the seal. The seals have three ships in total, two of them four squares long and the other three squares long. Once you’ve destroyed all their ships you’ll appear back in Ardougne Zoo and speak with Larry and Chuck about the mission. You can now hunt a new invisible penguin in the Penguin Hide & Seek D&D. This penguin is worth 3 points but can only be seen while wearing a ring of visibility. The penguin also teleports every couple of minutes and can travel almost anywhere in RuneScape. 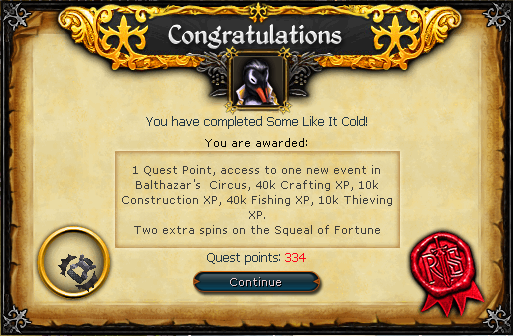 The new event in the circus to earn Thieving XP can be started by speaking with Teddy. The Rock and Pop costumes you made for Ping and Pong can be made again with the same materials, and be worn with your own clockwork penguin. Players who completed the quest before 21st August 2012 received an early bird experience tome awarding an additional 40,000 Crafting experience, 40,000 Fishing experience, 10,000 Construction experience and 10,000 Thieving experience.